From early on, Monet’s health would have an unusual and unexpected influence on his life and art. Recovering from one illness he developed a relationship with a painter that would help define his style. After a bout of depression, he fell in love with the countryside. A popular doctor to painters in Paris, Dr. Georges de Bellio, would become an early supporter of his, and declining eyesight would change the way he saw the world and the way viewers saw art. In 1861, Monet joined the military with the First Regiment of African Light Calvary, going to Algeria. While Algeria, a country in northern Africa, was under French control, there was a need for French soldiers to have a presence there. Monet’s time there would be short, but nonetheless, the landscape left a lasting impression on the young man. A year into his seven-year deployment Monet developed typhoid fever. In the nineteenth century, typhoid fever, a bacterial disease, was infecting people across the world from Algeria to Chicago. Caused by poor health conditions, it caused headaches, fever, and intestinal problems, occasionally fatal. His aunt, Madame Lecadre, was able to get the ailing Monet out of the service. While recovering from that illness, he enrolled in an art class and met Johan Barthold Jongkind a painter who was using light brushstrokes. Monet looked to Jongkind as a mentor, and he was undoubtedly influenced by his work as would show in Impressionism. By the late 1860’s, Monet was painting, but he was struggling to make a living with his art. He had some success, but not to the degree that he thought he deserved. Also around this time, his family was not happy with him and his decision to stay with Camille Doncieux the mother of his young son. As long as Monet stayed with Camille, his family cut his allowance. Facing both an economic and family crisis, Monet tried to put an end to his life. In 1868, Monet threw himself off a bridge into the Seine River attempting to commit suicide. 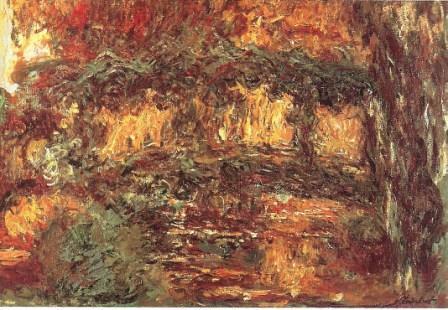 His attempt, however, was not successful leaving Monet in a troubled mental state. alternatives to the clear fix for his sight problem, surgery. One ophthalmologist had a solution. His name was Charles Coutela and he had eye drops that dilated the pupil of the left eye. At the beginning Monet was pleased with the results, but they did not last long. Eventually surgery was recommended. Monet put off surgery until 1923, but during that time he still painted. The effects of the cataracts could be seen in his work, as Monet simply painted what he saw. His brush strokes became broader as his vision became blurrier. He saw his whites, greens, and blues begin to change shade and disappear, replaced by yellows and purples. By 1919, Monet began to worry that he would need to stop painting. Cataracts also causes lights to seem especially bright and the glare is particularly irritable, so Monet could only paint during optimal lighting hours. At this time his painting also became more abstract, using a red-orange palette for landscapes instead of a green-blue one. There is no evidence to support that this was an intended stylistic change. Quite the contrary, when he finally got the surgery in 1923 he destroyed many of his works that he'd done with cataracts. The works that survive from this period are largely attributed to the intervention of his family and friends. He began to refine his Grand Decorations, the renewed eyesight giving him the ability to do so. While the causes of cataracts are still largely unknown, there are many studies that show different causes, minor or major. One suggested cause is cosmic radiation, although Monet didn't get much of that. Two small studies, one taking place in 2002 and the other taking place in 2004, showed that lead poisoning could be a risk factor for cataracts.1 Artists around this time were often exposed to lead in certain paints, Monet is even quoted saying that he used lead-based paints.